Bush/Basket (Determinate). 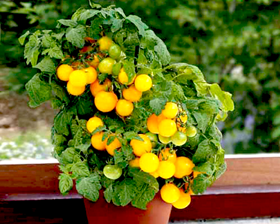 An exceptionally sweet cherry variety with the exciting attribute of being able to trail when grown as a basket plant, one plant filling a 30cm basket with ease. Tomato Balcony Wonder Gold is extremely decorative as well as productive. Sow February to May. Sow seeds 6mm deep in pots or trays of good, free draining, damp seed compost and cover with a sprinkling of vermiculite or compost. Place containers in a propagator, or seal in a polythene bag, at a temperature of 18-21C until germination, which takes 7-10 days.